Can An Exoskeleton Suit Boost Mental Strength? Exoskeleton suits have been developed to improve strength, ease heavy lifting, and even monitor the health of the wearer. Developers want to take the technology further by using exoskeletons, or exosuits, to also improve mental performance of soldiers in the field—a capability that may already be built-in. U.S. Army Research Laboratory scientists and engineers have been working on a variation of an exoskeleton suit as part of the Department of Defense funded Warrior Web program. 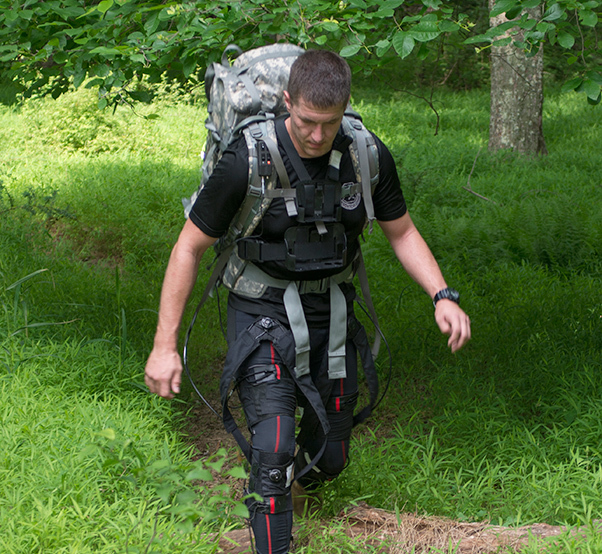 By improving the suit’s system of gears, pulleys, wearability, and overall functionality, the development team is also aiming to improve a soldier’s focus and mental processing as a direct result of reduced physical demand. After several years of testing at the Soldier Performance and Equipment Advanced Search (SPEAR) facility, researchers have created, tested and modified various prototypes of the exosuit. One of the latest variations to be tested at the Army Research Laboratory has been called a more user friendly edition, which features improved functional attachments, individual control systems, and quieter, more compact actuation systems. The improvements come from feedback gained directly from soldiers and from data gathered through numerous evaluations. In their testing, which compared performance while wearing the suit and without it, the Army Research Laboratory found that easing physical demands may contribute to better cognition. As researcher Dr. Angela Boynton explains, “If you reduce the physical burden on somebody, there may be some additional benefits including the amount of attention they can pay to their situational awareness.” Although the Warrior Web program is coming to an end, researchers are looking for future collaborators and funding sources to continuously improve exosuit prototypes, and finally get closer to a version that soldiers could soon wear for various military operations.